We make green decisions every day but what if one of the biggest decisions you will make as an adult could be completely green. I am talking about the city in which you decide to live. There are lots of green options when it comes to building a house but this concept goes beyond that and targets the entire city. 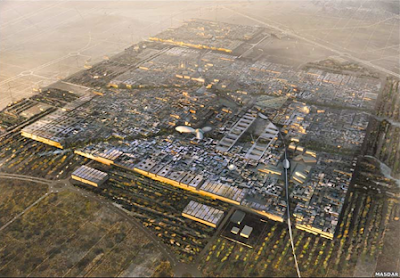 In Abu Dhabi there is a project under to build such a city, a city called Masdar. The plan is to make this city the first zero-carbon footprint and zero waste city in the world. Check out a video of the proposal. What will make this city green? Here are a few examples. The city will be 100% car free. Imagine the amount of emissions this would cut out of your city. Even just imagine the difference in noise pollution. Instead of cars the city will use solar powered magnetic transit. The city will be powered by 100% renewable energy. Air conditioning (which lets face it is a necessity in this climate) will be powered by wind technology. Buildings will be designed to ensure that energy consumption will be minimal. Waste will be converted to energy. There will be extensive recycling and composting systems. 80% of water will be recycled. It will be reused over and over again, even the water used on crops will be reused. Can you imagine what your life would be like if you lived in a city like this? When you see nations pouring their time, money and research time into projects like this it really makes you stop and look at what our own country is spending its money on. Although I have to say there is a small bit of creepiness to this project. Do you get to be an individual at all or are all homes exactly the same? Will everything be made in the city and thereby limiting your options for things like clothing? I don't know where to begin to list the reasons why this is total fantasy. A Green Dream, artfully created with computer graphics but standing no chance of ever fulfilling any of its claims. First, the site is how many feet above sea level? And we've all heard of sea level rise surely. Second, every city depends on a huge area of farmland to grow its food, and a vast network to get it there. All these hi-tech jobs don't create food, and it's nonsense to claim carbon neutral when to keep something like this alive would need massive amounts of carbon. Thirdly, there isn't the time to create new cities, many countries are already experiencing major flooding, which will increase over time making many existing cities - built on coasts just like this proposal - vulnerable to flood. New Orleans is just the first. This is yet another hi-tech idea which would, even if possible, be nothing more than a sticking plaster. What happens to the teeming, overcrowded, slum-rich mega cities that sprawl at present across the planet, expanding as more and more people flock to them from the countryside? One small newly built 'town' for rich Arabs to wait for sea level rise solves nothing globally. It is now the eleventh hour, we're forty years too late to do anything other than prepare for meltdown [literally of the ice caps and glaciers], inundation, global famine and the resultant chaos and strife that will cause. It may be reassuring to some, but its a distraction, and no solution to anything. wow, this place sounds quite idealic! To you it may be a fantasy but to others it is an ideal and at the very least a start. It will force others to think about how they plan cities in the future. That is not to say that every city has to be "green" but there are concepts in this design plan that could apply to cities around the world. No this one city will not have a major global impact (and what 1 project does really) but it will start to get people thinking. I think that is the key. When I wrote the blog I didn't include all the items that the city would have in it. Including the food aspect. They do plan to grow their own food within the city. Will they end up being carbon neutral? Who knows but that is the designers plan. There are lots of ways to achieve this. Companies have been doing it for a long time (offsetting their emissions) so the idea is not that out of realm of possibility for a city. New cities are popping up all over the globe. People continue to move into new area's and little by little communities become villages then towns then citiies. I don't see why this concept is so far fetched. And what is with all the talk of flooding? ?